Why Don't Supreme Court Justices Have an Ethics Code? 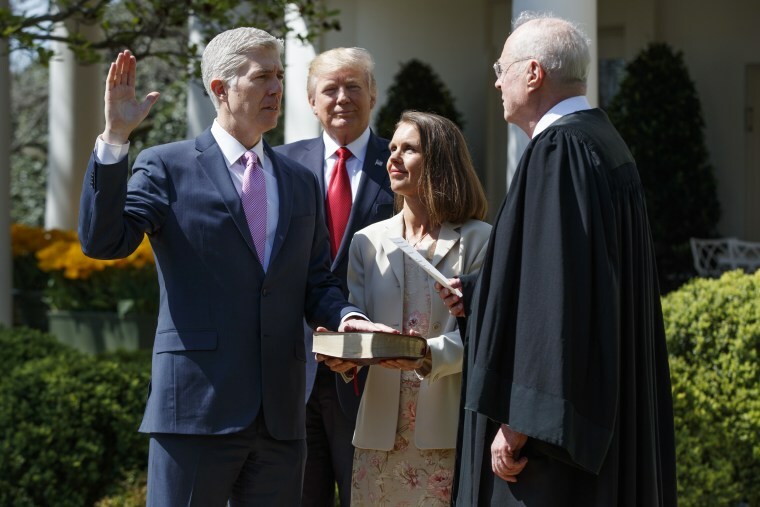 Now that Neil Gorsuch has been sworn in as the newest Supreme Court justice, he has something in common with President Trump, who selected him. Gorsuch, who had been a federal judge, now will have a special status when it comes to ethics, just like the President. Of the 4 million employees who work for the federal government, 11 of the highest-ranking ones are not bound by some of the ethics laws, rules and regulations which other public servants must follow: the president, the vice president, and the nine justices of the Supreme Court. But the oldest female member of Congress would like very much to change that, at least for the Supreme Court Justices. "When we do a Supreme Court justice, we want to know about their background in the law and everything that they know," said U.S. Representative Louise Slaughter of New York, an 87-year-old Democrat. "Nobody ever asks them, ‘Are you an honest person?’"
Slaughter has been waging a long battle to pass a bill that she says would make the justices more transparent about and accountable for conduct outside the Court. "The one thing that we take for granted, and give them the benefit of the doubt," said Slaughter, "is that they're not going to do anything that they would not have done as a federal judge." Slaughter has been sponsoring legislation since 2013 that would require the nation's highest Court to create and follow a code of ethics. Her bill is called "The Supreme Court Ethics Act." Last Wednesday, she reintroduced it for the third time. All other federal judges are subject to a published official "Code of Conduct for United States Judges," which applies to all employees of the Judicial Branch’s Administrative Office of the United States Courts. The code includes specific rules about ethics, integrity and even appearances of impropriety relating to outside business and political activities and the acceptance of gifts. Although Supreme Court Justices say they consult it, they are not bound by it or required to follow it. "The Supreme Court is the only one that doesn't have any kind of code to go by," Slaughter said. "We want the same code of ethics for the Supreme Court that we require for all federal judges. Just as simple as that." At a hearing before the Senate Judiciary Committee on his nomination last month, Gorsuch signaled his willingness to continue operating under that code, which he had to follow as a federal judge. "Do you think that there should be that same kind of federal ethics standards for Supreme Court justices?" asked Senator Amy Klobuchar, D-Minnesota. "Would you favor them having the same set of rules that apply to you right now?" "I have no problem living under the rules I've lived under," Gorsuch said. "I'm quite comfortable with them. And I've had no problem reporting every year to the best of my abilities everything I can. … I consider if part of the price of service and it's a reasonable and fair one." But Slaughter and other critics say a Supreme Court that is not required to follow any ethical standards risks losing its integrity, and the public's trust. Most surveys by the Pew Research Center in recent years have found that Americans' views of the Court had grown more politicized and negative. Although some Supreme Court watchers blame high unfavorable ratings on a polarized public’s belief that some of the high court’s decisions may be politically motivated,, Slaughter sees the out-of-court conduct of justices as a big reason for the public’s negative views. She points to justices who allegedly have made public appearances at events some see as political. A 2011 New York Times article reported that the late Justice Antonin Scalia, appointed by Republican President Ronald Reagan, and Justice Clarence Thomas, appointed by Republican President George H.W. Bush, had previously attended a fundraising event organized by two politically active and conservative businessmen, Charles and David Koch, according to information attributed to the Kochs. Slaughter also singles out Justice Thomas for alleged problems with gifts. According to a New York Times investigation, Justice Thomas may have accepted travel arrangements and other support from a conservative real estate businessman, but not reported them in an annual financial disclosure all Justices file. Others critics point to recent public statements of Justice Ruth Bader Ginsburg, appointed by Democratic President Bill Clinton, as questionable conduct that should be covered by a code. She told the New York Times over the summer that she "couldn't imagine" a Donald Trump presidency, but could imagine leaving the country because of it. In another interview, she called protests against the national anthem "dumb and disrespectful." Gabe Roth has been pushing for the Court to have more accountability through research and advocacy work he does through his nonprofit organization, Fix the Court. He sees the absence of transparency and oversight as a big part of a problem. "There's no outside body, there's no inspector general, there's no internal ethics office," Roth said. Roth sees trips taken by the justices and paid for by third parties as one category that needs more public disclosure and scrutiny. "If justices are taking a trip paid for by a private individual, or even a university or an interest group," Roth asked, "who's behind that? Why are they on this trip? Do they get some benefit from it? Members of Congress, candidates for federal office, senior congressional staff, Cabinet members and the president and vice president are required by the Ethics in Government Act of 1978 to file annual financial disclosure reports, disclosing their personal investments, as well as their outside positions and income, their spouses’ income, reimbursements for travel and other gifts. The Justices of the Supreme Court are not exempt from this rule. But the Justices aren't required to disclose why third parties pay for their travel trips, or their reasons for recusing themselves from cases, such as ownership of stock, or a family member's professional association with a party to a case. Detailed information about their trips, recusals and even their financial holdings is not easy to obtain, and sometimes only becomes known through reporting by the news and social media and advocacy groups. To count up the number of times Supreme Court justices recused themselves from cases because of possible conflicts of interest, Gabe Roth examined the Court's publicly released weekly orders lists to identify each time a justice "took no part" in consideration of a petition to the Court. According to his analysis, as of last July, there had been 223 recusals by justices since Oct. 1, 2015. Roth counted that Justice Elena Kagan had recused herself 71 times and Justice Sonia Sotomayor 17 times, mostly due to their previous work as U.S. Solicitor General and judge on the Second Circuit Court, respectively. While most of the filed recusals were due to previous work, Roth says, a portion of the recusals appear to have been related to stock ownership by Chief Justice John Roberts, and Justices Stephen Breyer and Samuel Alito. For example, Roth says Chief Justice Roberts recused himself from a case involving the payment of movie royalties in which a defendant was Kevin Tsujihara, CEO of Warner Bros. Entertainment. According to his financial disclosure submission, Roberts owns stock in media company Time Warner, Warner Bros. Entertainment’s parent company, worth between $250,001 and $500,000. Roth also says Justice Breyer recused himself from a case in which Cisco Systems was a defendant due to his ownership of between $50,001 and $100,000 in Cisco stock, and from a case involving Lowe’s, the home improvement retailer, due to his owning between $50,001 and $100,000 in Lowe’s stock. Meanwhile, Roth counts Justice Alito as having recused himself from 17 cases based on stock ownership in companies such as Johnson & Johnson, DuPont, PNC, Proctor & Gamble, and Oracle. While the Supreme Court declined NBC News requests for interviews or comment for this story, including requests for interviews with justices, there are some records of individual Justices’ opinions on these matters. In the statement, these justices pledged to recuse themselves from all cases involving legal firms in which a justice’s relatives were partners, unless the firm stated the relatives would not receive income from the litigation. But, more broadly, the statement noted a practical problem that recusals present for the nation’s highest court. "Even one unnecessary recusal," the statement said, "impairs the functioning of the Court." "In this Court, where the absence of one Justice cannot be made up by another," it continued, "needless recusal deprives litigants of the nine Justices to which they are entitled, produces the possibility of an even division on the merits of the case." Chief Justice Roberts and Justice Alito adopted this recusal policy when they joined the court, Roberts in 2005 and Alito in 2006. A Supreme Court spokesperson noted the Justices also "are bound by 28 U.S.C. 455 (attached, a section of the U.S. code), which substantively covers the recusal standards included in the Code of Conduct [for United States Judges]." More recently, in 2015, Justice Anthony Kennedy and Breyer testified before a House Appropriation Subcommittee responding to the questions of whether they believe they should be bound by the ethics code that applies to other federal judges, and whether the reasons for their recusals from cases should be more transparent. "There's an argument that the reason for recusals should be more apparent. I'm not sure about that," Kennedy testified. "In the rare cases when I recuse, I never tell my colleagues, oh, I'm recusing because my son works for this company and it's a very important case for my son. Why should I say that? That's almost like lobbying. So, in my view, the reason for recusal should never be discussed." "I have to make those decisions," Justice Breyer testified. "I will make them as best I can. I will do it according to the code of ethics. And so far, I've been able to do that and I don't want it to become an issue. And, all that leads me to say no, I don't want to have to give my answers if I don't want to." "It's a personal decision," he added. "I will follow the code, and that I think is the best way to run this institution." The most official recent statements from the Court about these issues appear in Chief Justice Roberts’ year-end report for 2011, in which he directly addressed the question of whether a code of conduct should apply to Supreme Court justices. Thinking that the Supreme Court "is exempt from ethical principles that lower courts observe…rests on misperceptions," Chief Justice Roberts wrote. "All Members of the [Supreme] Court do in fact consult" the official code of ethical conduct binding all other federal judges, Roberts wrote, as "guidance." "But at the end of the day," he observed, "no compilation of ethical rules can guarantee integrity. Judges must exercise both constant vigilance and good judgment to fulfill the obligations they have all taken since the beginning of the Republic." For some, the very assumption by the justices’ of their duties on the nation’s highest court represents their commitment they can be trusted to avoid conflicts of interest. But for Slaughter and Roth, and other critics, the Justices’ pledges that they consult a code they are not required to follow are simply not enough. "That's what the justices always say. You know, ‘We don't need specific or stricter ethics rules. Trust us,’" Roth said. "That doesn't pass muster." "It's up to each individual justice to make the determination of whether or not there's a conflict of interest," he said. "And that's not the case in other branches [of government]. "They are really ‘supreme,’" Slaughter said. "They don't answer to anybody." At Gorsuch’s confirmation hearing in March, Gorsuch answered Senator Sheldon Whitehouse (D-RI), who had asked a pointed question about transparency. SEN. WHITEHOUSE: Is it any cause of concern to you that your nomination is the focus of a $10 million political spending effort and we don't know who's behind it? GORSUCH: Senator, the fact of the matter is, it is what it is. And it's this body that makes the laws. And if you wish to have more disclosure, pass a law and a judge will enforce it, Senator. In the 114th Congress, which wrapped up its business at the end of December and officially ended in January, Slaughter's bill ended up with 129 co-sponsors in the House. All were Democrats. The number was far short of the 218 needed to bring it to the floor of the House for a vote. An identical Senate bill had only eight supporters, also all Democrats. Meanwhile, Republican Sen. Chuck Grassley of Iowa, chairman of the Senate Judiciary Committee, has repeatedly pushed other legislation with a different remedy: an inspector general for the Judicial Branch, including the Supreme Court. His bills have had no co-sponsors from either party. Rep. Slaughter remains determined to keep up the fight. Re-elected to a 16th term in November, she intends to keep pushing to get her bill passed, though this year’s version is unlikely to fare any better than its predecessors. The Supreme Court "is the last word," said Rep. Slaughter. "They are unassailable, they are un-appealable. I want 'em to be right."